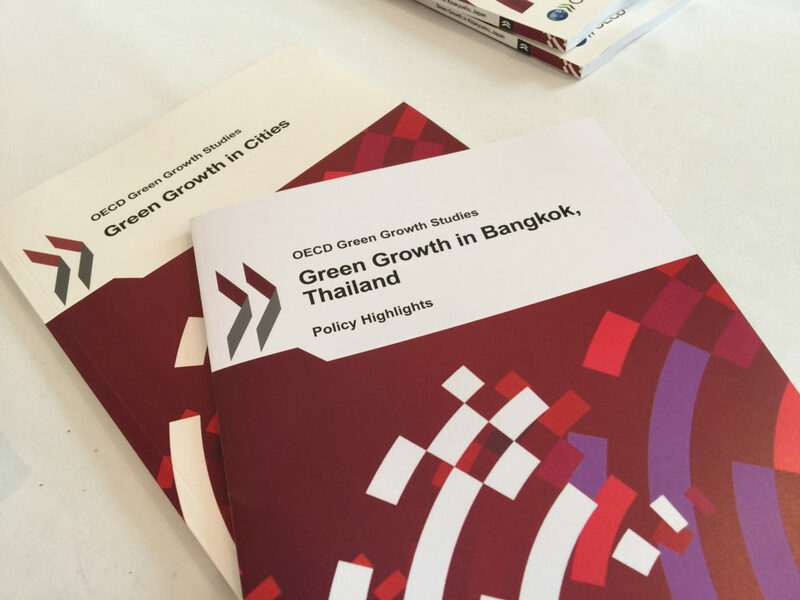 The OECD and Bangkok Metropolitan Region (BMR) launch the new report “Green Growth in Bangkok, Thailand”. The report discusses policies and enables strategies for fostering green growth in Bangkok with a focus on urban climate change resilience. The report was the result of OECD’s policy study in Bangkok, under the project framework of “OECD Green Cities Programme: Urban Green Growth in Dynamic Asia”. The OECD analyzed the economic and environmental performance of the Bangkok Metropolitan Region (BMR), identifying their best practices for green growth in policy and governance, and providing recommendations to further strengthen its potential for green growth. The Bangkok Metropolitan Region (BMR) is home to 10.5 million inhabitants (14.5 million if including the non-registered inhabitants). It plays a dominant role in the Thai economy, as it represents 44.2% of the national GDP in 2010. The economy is mainly driven by the manufacturing and service sectors. Despite of its prominent economic role, BMR faces a range of green growth challenges, including its high levels of inequality, increasing greenhouse gas emissions, air pollution, destruction of natural assets, traffic congestion, poor wastewater and solid waste management. For example, only the half of the wastewater generated in the city of Bangkok is treated. In addition, being a metropolis located slightly above the sea level, BMR is highly vulnerable to seasonal floods and storms, which have resulted in important economic losses. While the Thai Government and BMA have taken key initiatives to encourage green growth in the metropolitan area of BMR, the report’s findings point to room for improvement in several areas of opportunity: energy; buildings and housing; land use and transport; water resources management; solid waste management; and green goods and services. A specific focus is placed on climate change resilience in Bangkok.